Rhode Island is the smallest state in the country, making its population density of 1006 people per square mile seem high. However, it’s population is just over 1 million, which is much lower than the majority of states. Rhode Island is home to Brown University, one of the top universities in the country. There are beautiful forests and scenic coastlines here. We’ll go over the safest cities in the state so you know which areas are best for you and your needs. 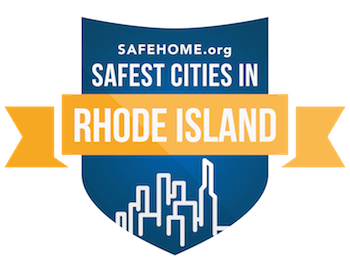 Rhode Island has three of the top 500 safest cities in the country. The 25 safest cities in the state range from a high of 90.44 to a low of 71.91. That is very good and amongst the highest safety rating range in the nation. 20 of those cities have a safety score of 80. Even more impressive, is how nearly all of 25 safest cities here have seen a drop in property crime rates. Portsmouth is the safest city in the state, with a safety score of 90.44 and a population of 17,377. The median income is $88,577 for a family here. This city is spread across the Narragansett Bay, which gives it a unique geographical outlay. People who live here tend to be more about the outdoors and sea type of life. This type of lifestyle, along with the long history of the town, gives the residents a strong bond and sense of communal pride, significantly reducing any propensity for crime. For those not wanting to live by the bay or on an island, have many other options in the state of Rhode Island. Burrillville is at the northeast corner of the state, Connecticut and Massachusetts. It has a safety score of 89.96. South Kingstown is a coastal town with a safety rating of 89.71. The largest city, Providence, has a population of 179,522 and a safety score of 71.91. You really could move to any of our 25 safest cities in the state, and be perfectly happy and secure, as you’re not far off from surrounding large cities and beautiful scenery.